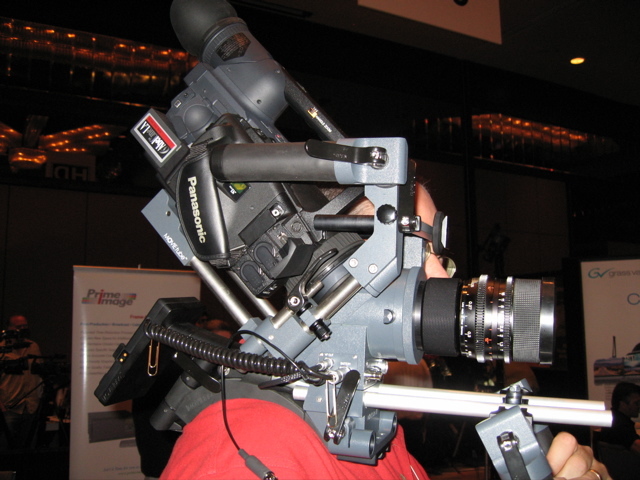 If you can't make the trip to NAB in Las Vegas, or just can't make it through all those aisles of vendors, then fortunately there's HD Expo and DV Expo. Coming to LA only two weeks apart from each other, these two smaller conferences extract the necessary parts of NAB (to a low budget filmmaker, at least) and put them in a more manageable form. The similarities in name carry over on to the floor--these are two very similar shows, with DV Expo being a bit larger. 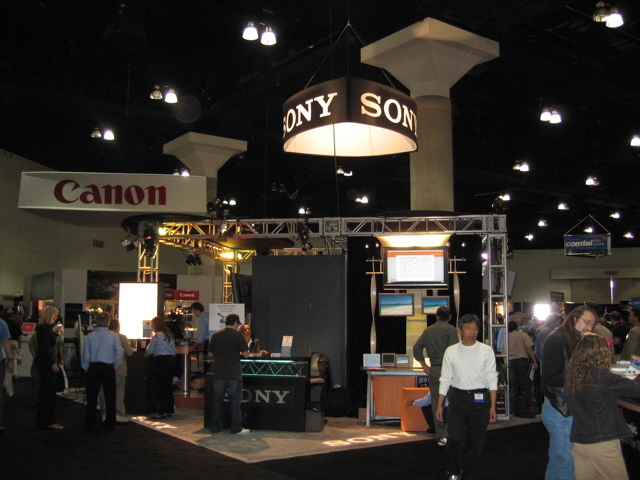 I attended both events to get an update on the things I saw at NAB 2006 and a preview on what I'll catch at NAB 2007. I was most excited to see the new, affordable HD cameras that were there. First stop at DV Expo was the Sony booth where they unveiled the new Sony HDV camera, the HVR-V1U (or V1 for short; the U is for United States). Finally, Sony gets into the 24p game with this affordable, small, 3-CMOS chip camera, "the world's first HDV camcorder with true 1080/24p scanning," (the JVC HDV is only 720p). 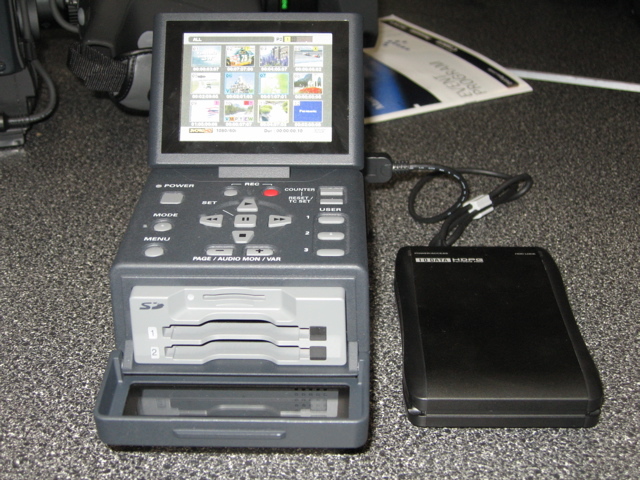 And they gave the V1 a little buddy, the HVR-DR60 hard disk recorder, which can record 4.5 hours of material that's "ready to edit." While this camera also records to tape, that format, as I've said, is starting to see the writing on the walls. 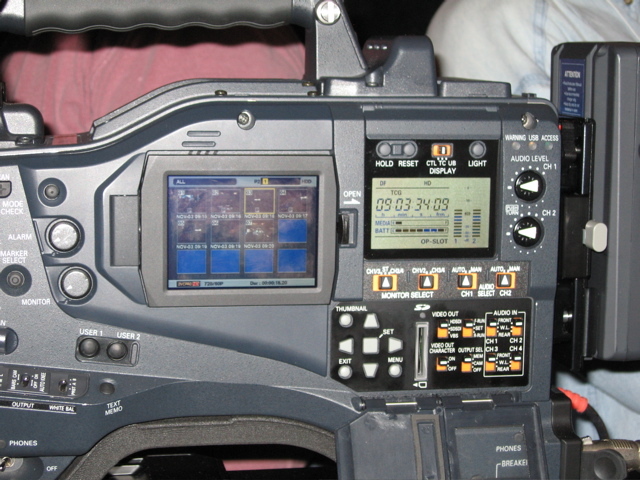 Film will be around a lot longer than tape as a capture medium. Not to be outdone, Canon introduced a trio of interesting cameras. 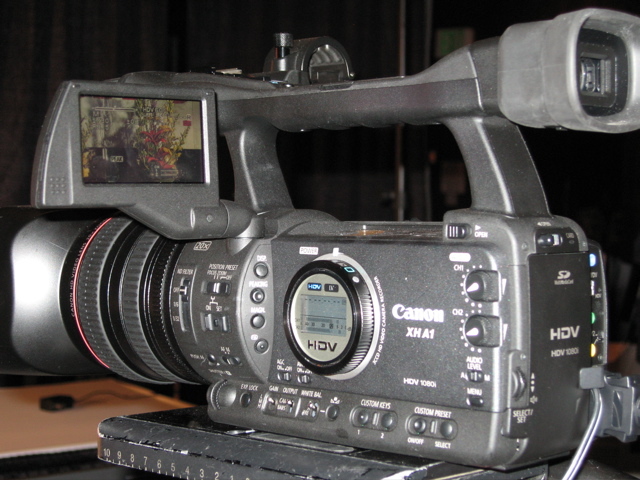 Though it has been getting rave reviews in many magazines, I've never been a huge fan of the Canon XL H1 HDV camera. 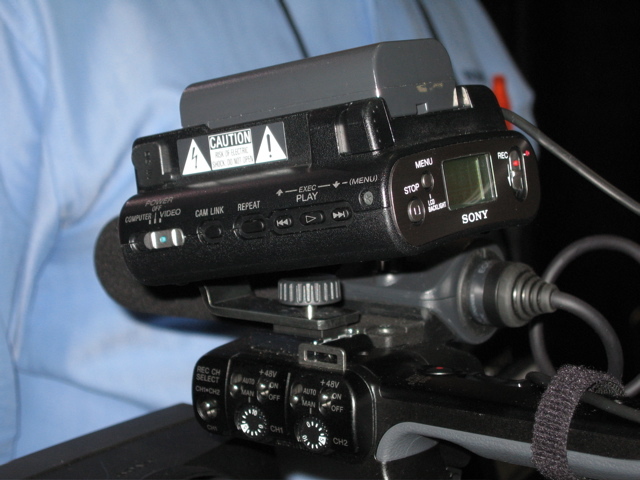 Yes, the image quality (and lens) are remarkable for a $10,000 camera, and yes, if you have an HD deck or something like a Wafian HR-1 direct-to-disk recorder, you can deliver HD-SDI uncompressed output. 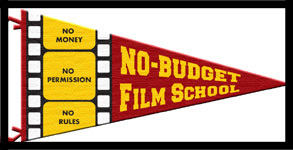 But wait a second, you're a no-budget filmmaker! Where are you getting a cheap HD deck or a Wafian, and how are you going to edit uncompressed HD on a budget? And this camera is huge. And what is 24f, anyway; I want 24p! Well, Canon heard me I guess and introduced the XH G1 and XH A1 cameras. About the size of their popular SD GL2 camera, these new HDV cams are essentially H1's with a fixed lens and a real pull-out monitor; same 1/3" chips, and the G1 has the same JackPack (HD-SDI out, Gen Lock, TC), but in a much smaller, more stealth package. I said trio--Canon also showed off their fun little (and I mean little) HV10, "the world's smallest and lightest HDV camcorder." This is an impressive little camera for the size and price. It doesn't have a 24f mode, but if you're looking for a 30 frame HD camera that's super-stealth, this is it. I'm being told that 24f is going to give you a true 24p look, now that the NLE's support it, which is the most important thing to me. So if you're willing to work around the post workflow issues of HDV, these new Sony and Canon offerings are looking mighty good. Panasonic didn't have much new to offer in the low-cost range at these Expos, but if you're looking a little higher up the food chain, they were showing the HDX900 and the soon-to-come HPX2000. 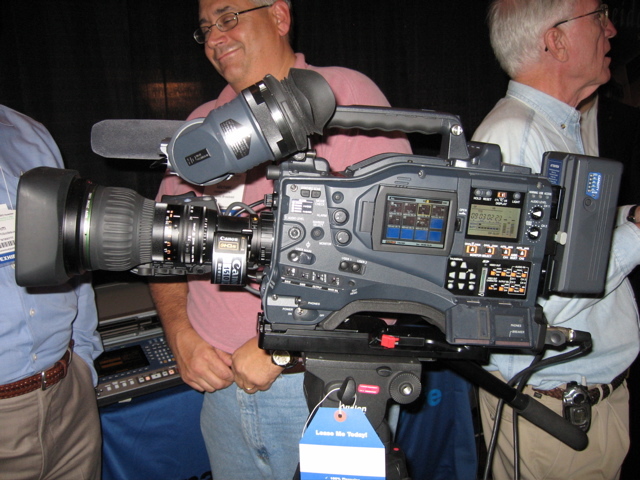 Think of the DVCPRO-HD HDX900 as the cheaper alternative to the Varicam, just without the "vari." 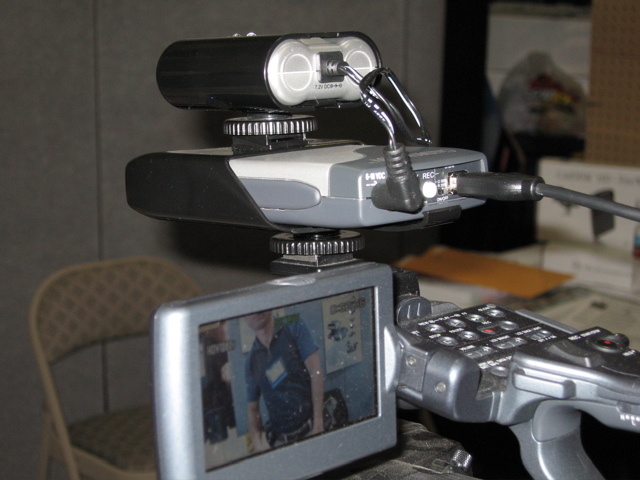 If you need an affordable 1080/24p intraframe camera with 2/3" chips, this might be for you. But it doesn't do slow-mo and you'll need a deck (no P2). 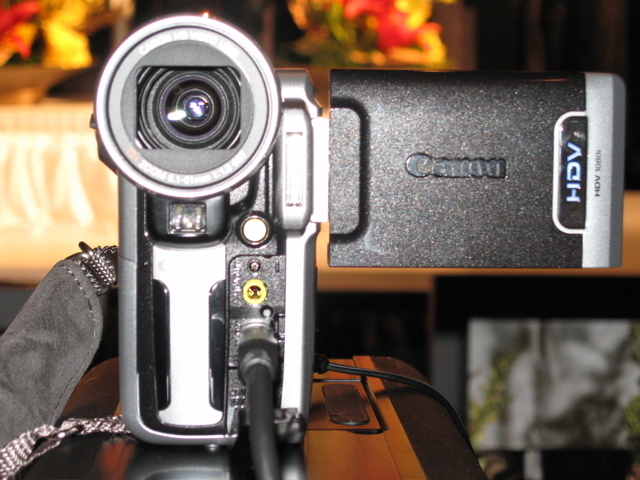 The HPX is a 2/3" DVCPRO-HD P2 camera, so you won't need the deck. 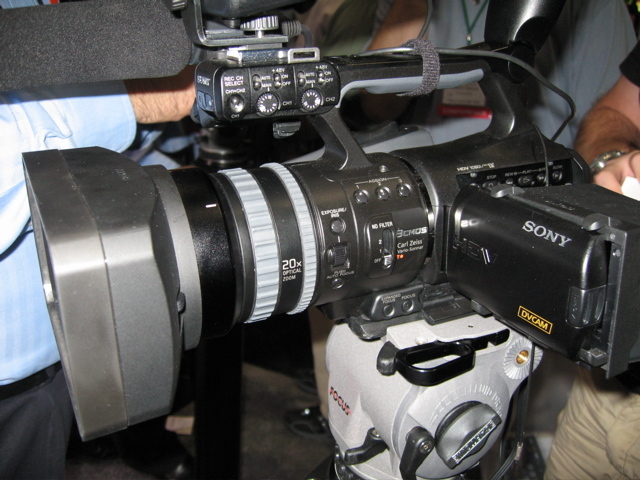 Coming in January and priced at around $27,000 (sans lens, about the same as the HDX900), the HPX will be able to record in the new AVC-Intra codec which effectively doubles the capacity of the P2 card (in the 50Mbps mode) with the same quality as DVCPRO HD. In the 100Mbps mode, this new codec will offer image quality comparable to D5 HD. Both Apple and Avid have pledged support for AVC-Intra in upcoming versions of their editing software. There were a number of interesting accessories to be found on each of the Floors. Because the new 16GB P2 cards are still not available (coming Spring 2007, or so they say), and most won't be able to afford them anyway, many HVX200 users and others are turning to hard disk recorders. Until recently, there was really only one game in town--Focus Enhancement's kinda big and kinda expensive FS-100. 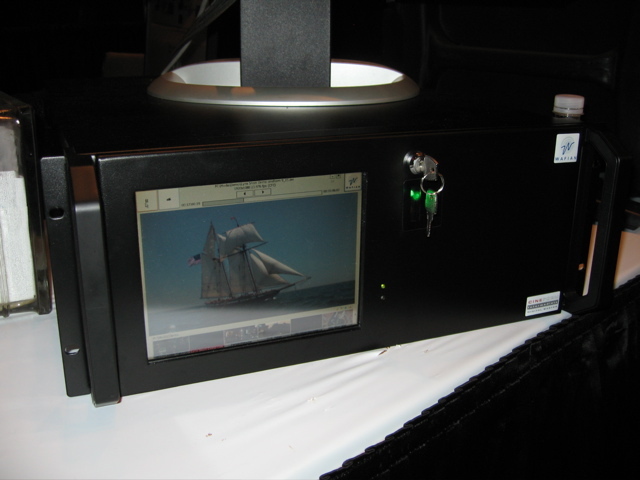 Now Shining Technology offers the FW1256HD (in 100GB and 120GB models) that are smaller and less expensive than the FS-100. They come with an internal, rechargeable battery, but you can also buy an accessory kit that includes an external battery and hotshoe adapter which allows the FW1256 to comfortably ride on the top of your camera. For those of you who demand the shallow depth of field that only a 35mm lens and adapter can give you, Kinomatik offers the new Movietube, an improvement in technology over the popular P + S Technik 35mm adapter. 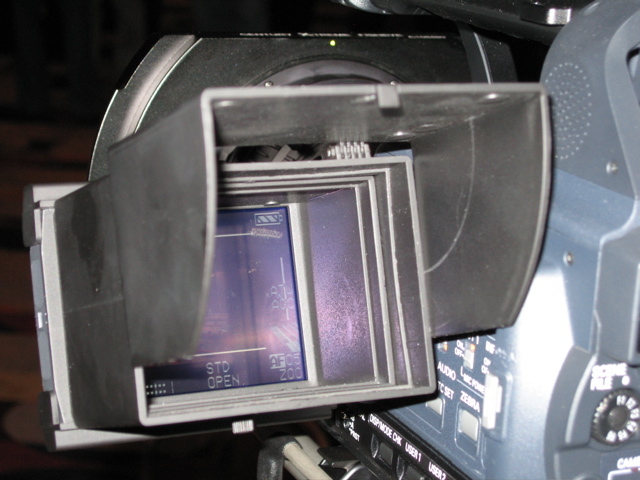 Once you get used to the sight of your camera aiming down, the well-constructed Movietube is actually pretty cool--if you can afford to rent it and the lenses you're going to need.